Companies don’t give enough information about benefits and how to make a claim, the Central Bank has said. SOME CONSUMERS ARE paying for gadget insurance twice because they didn’t cancel an existing policy when taking out a new one, according to the Central Bank. One in five people (21%) are paying for cover they no longer need and can be paying ‘on the double’, new research has shown. Sellers of gadget insurance are required to consider any relevant existing insurance cover when recommending a new policy to a consumer, the Central Bank said. 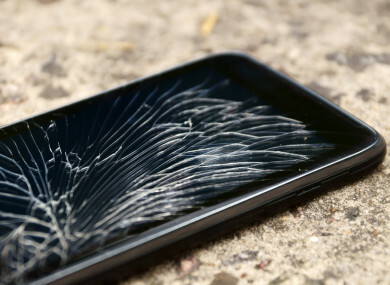 Mobile phone insurance is the most common type of gadget insurance and is generally sold to consumers as an add-on when they are buying a new phone. A report published today also found that companies which sell gadget insurance sometimes provide insufficient information and “need to do more to ensure that consumers are made aware of the key product features, benefits, exclusions, how to make a claim, and the total cost of the product”. Three insurance firms, which account for over 80% of the market in Ireland, were inspected as part of the research. These firms sell gadget insurance through brokers and retailers. About 700 consumers were also surveyed to examine their attitudes, behaviours and experiences when buying gadget insurance. Inadequate information is provided to consumers at the point of sale and during the life of their policy, which can be up to five years. The Central Bank expects firms to provide an annual statement to consumers detailing their policy, including benefits/exclusions, premium details and how to make a claim. The overall price of gadget insurance is not clearly presented to consumers. Insurance firms are expected to provide additional information on price to empower consumers to make informed choices. Claims acceptance rates on gadget insurance are high, at an average of 91.6% across the firms inspected. Did not supply the insurance firm with all information and evidence required, in order for the insurance firm to verify the validity of the claim. Firms are required to ensure the documentation issued to consumers, at point of sale and thereafter, is clear around how to make a claim. Commenting on the findings, the Director of Consumer Protection, Gráinne McEvoy, said that with the Christmas shopping period well underway, many people will be “making practical decisions to buy gadget insurance for their new phones”. “Our inspections and consumer research show that there is a gap between what most consumers believe their gadget insurance covers and what it actually covers. As many consumers buy this type of insurance as an add-on when buying a new mobile phone, it is really important for sellers to ensure that the product they sell meets the consumer’s individual needs. Email “Some people are paying 'on the double' for phone insurance ”. Feedback on “Some people are paying 'on the double' for phone insurance ”.